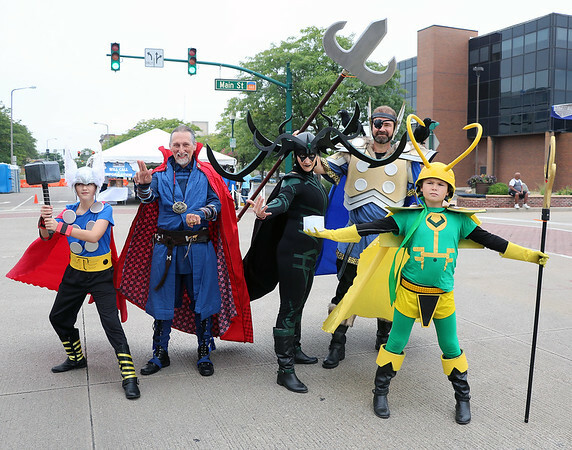 A common site on Main Street in Elkhart Saturday and Sunday were people dressed as their favorite character from movies, comic books, video games and other media. Posing from left are Frank Billingsley, 12, as Thor, Dennis Wise as Dr. Strange, Tricia Billingsley as Hela, Godess of Death, Sherman Billingsley as Odin and Sam Billingsley, 10, as Loki. Wise is from Elkhart and the Billingsleys are from LaGrange.